Big news from George Mason University. The University Libraries’ Special Collections and Archives is the new home of the Gilbert and Sullivan Collection donated by David and Annabelle Stone. The collection is all things Gilbert and Sullivan from original manuscripts to production materials to letters and personal effects. Read the press release to learn more about the donation. Want to know what other collections George Mason University has? Search Virginia Heritage to see their finding aids. This entry was posted in Announcements and tagged George Mason University, new acquisitions on October 9, 2014 by Margaret Kidd. Originally posted on George Mason University’s Special Collections & Archives blog Vault217 on February 17, 2014 by Jordan Patty. 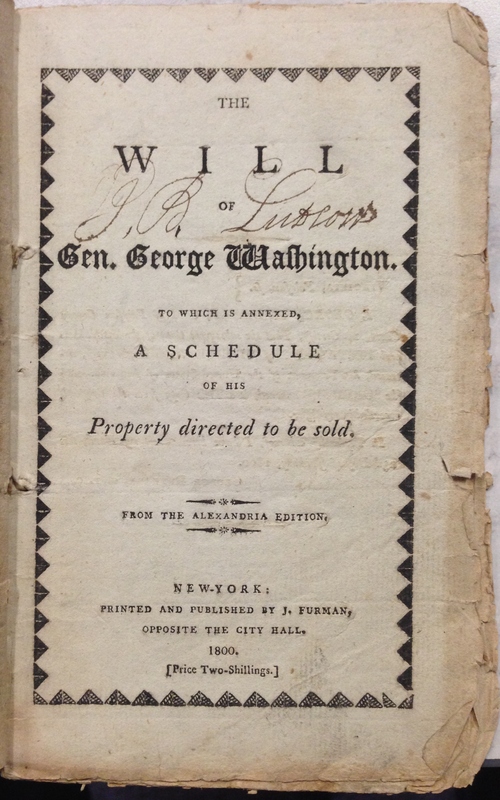 Title page from a published copy of George Washington’s will and testament (January 1800), Randolph Lytton Historical Virginia Graphic Material Collection, George Mason University Libraries, Special Collections & Archives. Public Domain. There are some noticeable differences between it and the title page from the copy that was printed in Boston in February of 1800 that is available through Google books and held at the New York Public Library. For further inquiry into this document, the Papers of George Washington includes a transcription of the will as well as the original handwritten will. This entry was posted in Collections and tagged George Mason University, George Washington, new acquisitions on March 12, 2014 by Margaret Kidd.